To thrive in today’s challenging healthcare environment, Visage has architected Visage 7 to support the largest healthcare enterprises, with massive scalability complementing native speed and power. Visage 7 is able to provide a single viewing platform for even the largest imaging organizations, including native mobile support with Visage Ease Pro and Visage Ease, eliminating the need for multiple PACS and countless imaging viewers that many imaging organizations struggle with today. 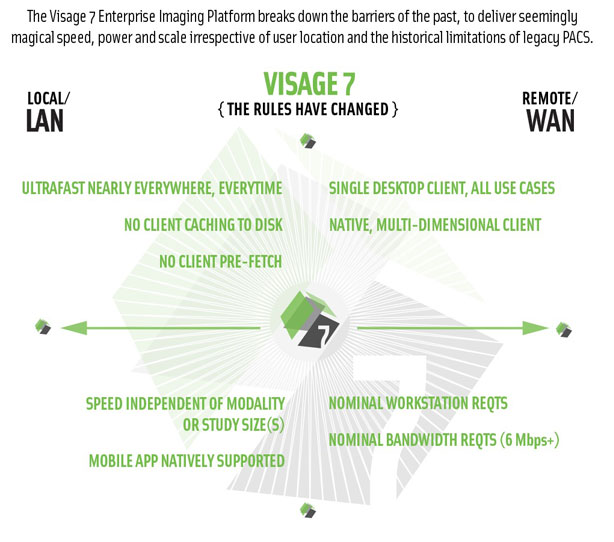 Notably, many organizations are choosing to implement Visage 7 in tight integration with an enterprise workflow platform plus vendor neutral archive (VNA), or the Visage 7 Archive, to dramatically leapfrog their current imaging capabilities. Visage 7’s neutral, symbiotic design is optimized to minimize legacy server-farms, as well as integrate with existing informatics infrastructure simplifying operations, maintenance, support, training, and administrative overhead. Yes, Visage 7 allows organizations to go big, and do the seemingly impossible: deliver cutting-edge enterprise-wide clinical functionality, while simultaneously reducing infrastructure demands and day-to-day overhead. 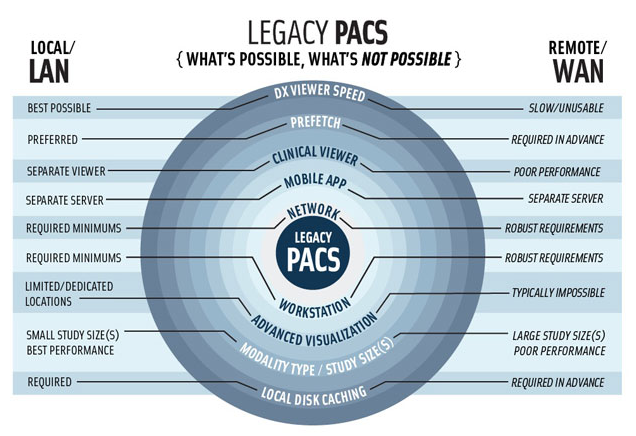 Large IT organizations appreciate Visage‘s flexibility for third-party bi-directional integration to Workflow, Reporting, VNA, RIS, PACS, as well as the most widely deployed EHRs. Visage 7 offers an architecture that supports centralized, decentralized, and/or hybrid architectures; as well as high-availability and disaster recovery solutions. Visage 7 has the sophistication of enterprise-class IT systems, including support for virtualization; end user management via Active Directory, IWA and/or LDAP; as well as the foundation for flexible, robust security. *Note: Visage Ease Pro includes FDA 510(k) clearance for the mobile diagnostic interpretation of all imaging modalities except mammography. Visage Ease is not a medical device and must not be used for diagnosis.